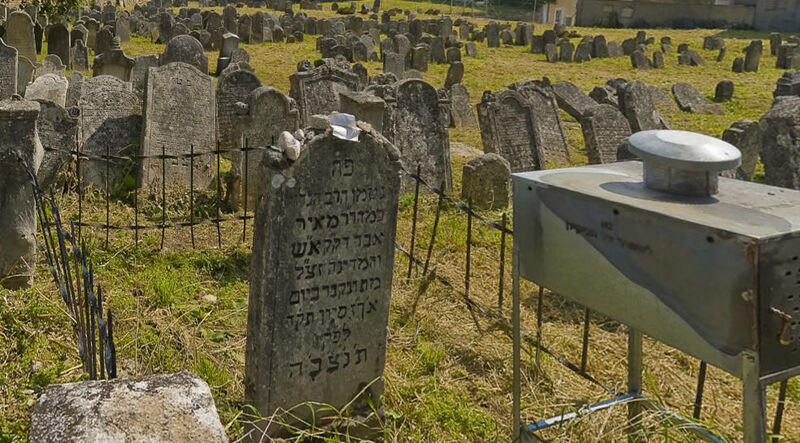 The most important grave at the old Jewish cemetery in Eisenstadt and probably the most famous of all Jewish cemeteries of today's Burgenland, is that the first rabbi of the community Eisenstadt: Meir ben Isaac, who later took the name of his place of and - in the Hebrew acronym - Maharam ASCH is called. 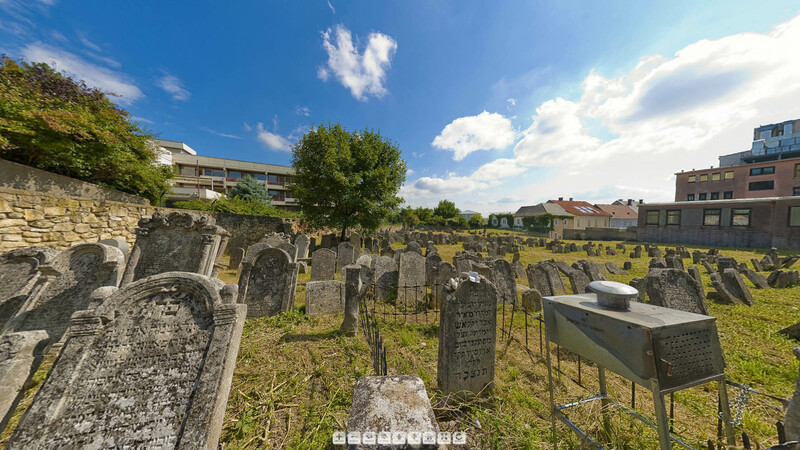 See also our "Panorama Tour" the older Jewish cemetery in Eisenstadt with the Grave of Rabbi Meir Eisenstadt! His most famous work is the response collection "Panim Me'irot"(Shining face), the first part is formed already in Proßnitz and published in Amsterdam 1715th The two remaining parts were printed in Sulzbach 1733 to 1738th A conspicuous feature of all judgments is the strict objectivity of the decisions are taken. Because for him said the sources, however, Meir turned for example, once against the modern guise substances which should replace the prescribed leather shoes on Yom Kippur and on Tisha be-Av, or did not allow prepared by Christians on Shabbat coffee, although this mainly for Christian was intended and, therefore, the work was not done at the instigation of a Jew. On the other hand, he saw in the use of a carriage with cushioned covers that are sewn with cotton thread no offense against the "Shatnez" - (Mix) ban from the third book of Genesis 19:19 "You shall not create stitched for two threads dress"Because any reference to any kind of clothing was missing. and in another place it is apparent when he speaks generally of "mendacious tongue" and "detractors and denunciation". The exact incident is still in the dark, but it seems the community to have been to the 20th century, aware of this embarrassing incident: Monday and Thursday was turned on in the synagogue each after the Torah reading its own "Eisenstadt prayer" as "sad souvenirs and not dispassionate memento of those dreadful full time because of the world-famous new founder of the community, Maharam ASCH, had to flee because of vile showing off from Eisenstadt ". The prayer included a request that God would banish the Zwietrachtstifter and malevolent detractors who at the time called Mosserer from the midst of Israel. Curse and destruction should be their lot, endangered the existence of so many community, but the rest of the people, the rebuilding of Jerusalem should be able to look forward to. Equally of course, but it was also that the decrees repeatedly led to non-compliance and protests in the community. Centuries later the prohibition of gambling cards offered rise to disputes and disagreements among the inhabitants of the district: 1840 a conflict arose between Rabbi Isak Moses Perles and the parish council Leib Wolf in matter of the ban at the time adopted by Rabbi Meir of the card game. For when the rabbi made a proclamation, as usual, in the synagogue after the allowed to play time that playing was banned again, had said parish council, which this notice did not appeal to proclaim publicly by the beadle that the game is still further permits. Loser then, was the rabbi who could not cope with this defeat and left his community. Nevertheless, it did not work in the community careless with the prohibition order, because with renewed transgression led to the withdrawal of home law. Although you could also in such a case, which is a document often proves to apply for leniency to the board, a provision was however subject to the condition to participate actively next to lead an impeccable conduct. In any case, a violation of the ban took considerable trouble and embarrassment to himself. (Gambling is prohibited, as in the old days). 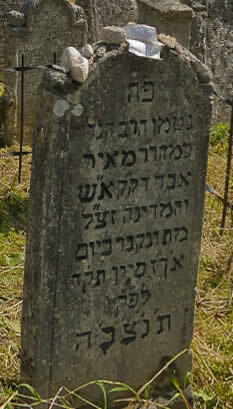 Maharam ASCH died on 27 Sivan 5504 in Eisenstadt (07 June 1744; this year is the coming Wednesday, 29 June 2011). His grave in the old Jewish cemetery is today - especially in these days, to his "year"- the goal of Orthodox Jews around the world that keep the memory of this great teacher. When Rabbi Meir Prossnitz (Moravia) was a rabbi, learned at his yeshiva there Rabbi Jonathan Eibeschuetz (s. http://en.wikipedia.org/wiki/Jonathan_Eybeschutz). Which was later attacked by Rabbi Jacob Emden, because the latter stopped him for a disguised Trailers Sabbatai Zevi. The most intensively guided dispute Eibeschuetz - Emden split his time the european Jewish communities and is, according to some researchers, have led to a negative opinion of rabbis and religion among many Jews. In Prossnitz Sabbatianism to have at all had numerous Trailers. The Sabbatians Loebele Prossnitz came from this community. And much later the Prossnitzer Jews were jokingly by their co-religionists "Schaebsen" called (of Schabbatai = Sabbatai). For a while, the Chatam Sofer lived by the way in Prossnitz. He had married there (his first wife), the daughter of the reinforced. Rabbi Moses Jerwitz. There was also some talk that he should be elected there as a rabbi. However, nothing came of it. Instead, he became rabbi in Dresnitz (Strážnice also in Moravia) and finally in Mattersdorf. So how Claudia writes below: 2. Rosh Chodesh Tammuz = 1 = 5528 Thursday, June 16, 1768. "The child's fees in a six-Soft are built from Miriam daughter of the great luminary Rabbi, Rabbi Natan Neta pushed ..."
Oh, the card game ban! I believe, because there was such a story, a much later time when the parish Wolf because of his wife, who loved playing about everything, the card game of Hanukkah not know how actually mandatory, prohibition, and the then rabbi why in protest be Office resigned. It seems to me that was Rabbi Yitzchak Moshe Perls. The then went after after Bonyhad, but got there because of incessant struggles with the Neologs Zores about Zores. That's right, the story got eh indicated above (height image of the grave stone). Correct, it was Rabbi Perls. And that really still sadder turn thing is that the poor Rabbi Perl's not really wanted to get away from Eisenstadt, but just leave the church "had" because he urged his conscience and his good character to ... and that he, in the Hungarian community where he was on duty, soon died, probably of grief! And because it's so beautiful to fit even a small note: card playing was still allowed 3 times a year: at Hanukkah, Purim and ... and that's always quite interesting that hardly anyone when we talk about exactly this third exception ridge ripe can call (an empirical value, and I speak of (young) people to whom the card game ban else but more or less familiar). This third exception is the time of the new mother (whether boy or girl just different lengths). The woman Frumet Wolf would be even worth a separate article. There was a story going along that a Lady travelled beyond the Ban's boundary to play cards there, rather then break this Ban. @Meir: This is also my knowledge. From the time Maharam ASCH's mine is only known that the card game was allowed during Hanukkah (and definitely to 1938), in other communities (in Germany ...) permission (apparently by rabbis, who also introduced the card game ban) was my knowledge extended to the three aforementioned festivals or occasions. A proof that the card games in Eisenstadt was allowed really ONLY during Hanukkah, I certainly have not. 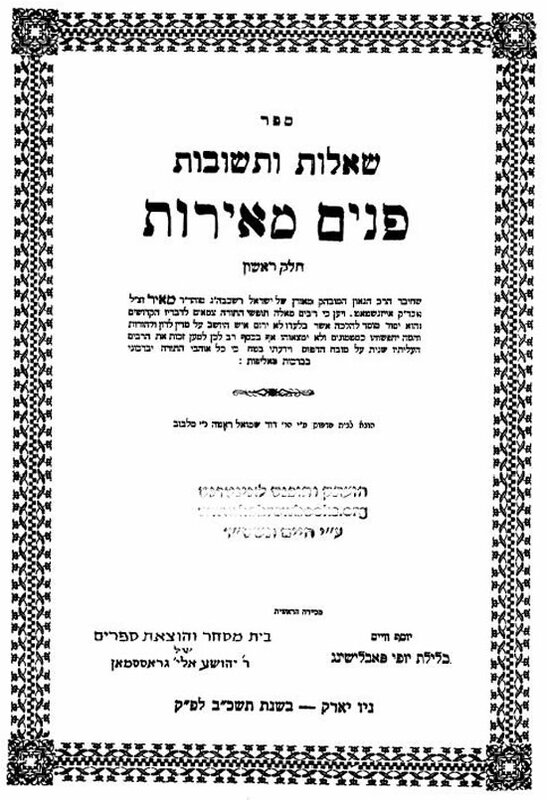 The Card Playing topic in Jewish Responsa what researched and published in: Meir Ayali, The Sittenverordrnungem the town of Eisenstadt from 1730 in clear rabbinic Responsliteratur 'in "Shlomo Spitzer (editor), contributions to the history of Jews in Burgenland, Ramat Gan 1994 ". The scope of this research goes beyond Eisenstadt. To the question of a bride's father he ruled that the wedding can be cancelled as the future bridegroom was a משחק בקוביה = gambler (playing cards were not yet introduced). Below is an episode from Eisenstadt concerning the Card's Playing Declaration. 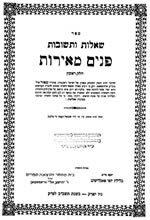 In the year 5599 (1838) the Rosh Hakahal was absent from Eisenstadt, therefore the Rabbi declared it and did not wait for the Rosh Hakahal to do it. The Rosh Hakahal saw that act as an offence and insult; therefore he started to reduce the Rabbi's salary.